Most of us decide the recipe first then buy the ingredients. But I normally check what I have, then decide what to make. I am telling because I have lots green chillies and curry cut meat. So I think that Rezala will be the perfect recipe. 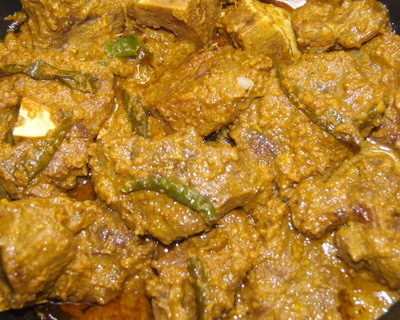 Rezala is meat curry cooked with green chillies. For green chillies it has a fresh flavor. If you want, you can use saffron imitation. Personally I cook with saffron imitation. 1. Mix all ingredients except chillies in a pan. You can marinate it for 1 hour. 2. Heat the pan and cook it under closed lid till oil is separated. 3. Add 3 cups water and green chillies. 4. Cook it under closed lid on medium heat about 30-35 minutes or till meat becomes tender. 5. Serve hot rezala with rice, palou , roti or paratha and enjoy the fresh flavour of green chillies. Hi. Thank you for sharing your unique, healthy and less spicy recipes. Last weekend I prepared morog-polao following mostly your recipe (a little addition was saffron and kewra water) and my hubby greatly liked it. today I will prepare rezala following your instructions. Thanks, you rock and have a great time. Hope to get some more new recipes from you in time. Most welcome.Kewra water is a good suggestion .. Thought I would let you know how much I am enjoying your recipes. You really are doing a great job. Have you written a cook book yet ? You definitely should ! It will be a huge success. I wish you good luck and success in your endeavours. By the way, I don’t receive the new recipes any more, pity.